Hundreds of bills pass through the Legislature each session, and an even larger number of important decisions are made. The 134 elected legislators do not make those decisions alone. Legislators rely on input from multiple sources during the lawmaking process. Activities, from lobbying to day-to-day conversations, provide lawmakers opportunities to receive input, and the source of the input is as diverse as the scope of the topics covered each session. Lobbying simply means trying to influence the passage of legislation to further the goals of an organization or person a lobbyist represents. Registration is on a yearly basis, and those who are required to register must also undergo official training within 90 days of registering and before lobbying. Individuals required to register are those who receive compensation for lobbying or those who spend money on a public servant in furthering of their lobbying activities. Groups such as unions, business entities and other associations utilize lobbyists to influence lawmakers. Although those individuals are paid to lobby, they are not the only ones who have the ears of legislators. During the Legislative session, individuals from state agencies and executive boards appear before committees to express the wishes and needs of their respective agencies to try to encourage the committee to act in favor of the division or department. Those agency and board members and directors do not have to register as lobbyists unless they meet the two requirements for registration. However, they still speak to lawmakers and influence the process. Members of associations attend committee meetings and public hearings to speak to legislators much like the executive directors. While these organizations may have professional lobbyists working on their behalf, the typical members of those groups also organize to contact and influence legislators. Additionally, average citizens influence legislators at the Capitol and from their homes across the state. Throughout the Legislative session, days are designated for different associations, cities, municipalities and organizations across the state. On those days, citizens who are part of those groups visit the Capitol and speak to lawmakers and others to express their interests. Citizens also have the opportunity to visit the Capitol Complex themselves. From touring the grounds and marble halls to meeting with Legislators, visiting the Capitol presents citizens with an inside look at the process and the people who are key components of that process. The Legislature also provides constituents multiple methods of reaching its membership. Lawmakers have capitol phone lines, e-mail addresses and mailing addresses, which can be found on the Legislature’s web site: www.wvlegislature.gov. Because West Virginia has a citizen’s legislature, lawmakers are only in Charleston for part of the year. For the rest of the time, they are in their hometowns, working in their other careers and interacting with their constituents, friends and families. The Legislature’s representation of the state depends on the various kinds of input offered from constituents and organizations, and, as the First Regular Session of the 80th Legislature draws to a close, the massive workload is made a little easier by the input of those who express their needs and ideas to their representatives. Senate Bill 382 will specify additional activities for which members of the National Guard or Armed Forces Reserves, who are also public officials and employees, are entitled to a leave of absence. Senate Bill 507 will continue the Broadband Deployment Council, which is created under the Department of Commerce solely for administrative, personnel and technical support services. House Bill 2475 will include certain records of the Division of Juvenile Services in the exemptions from Freedom of Information Act requests. House Bill 2709 will permit county school boards to enter into energy-saving contracts, in which the contracts are allowed to extend 15 years. House Bill 2882 will allow the Commissioner of Banking to assess state banks on a quarterly rather than semiannual basis. House Bill 2962 will increase the amount of a fine or penalty the Commissioner of Banking may impose on residential mortgage brokers and lenders for violations. 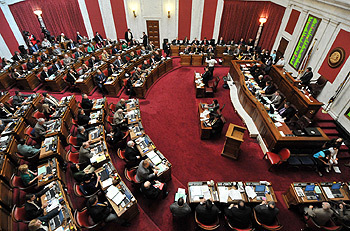 Senate Bill 18 would require certain employees of licensed private clubs and retail outlets selling alcoholic beverages to take the Techniques for Education and Alcohol Management course, the Training for Intervention Procedures course and Alcohol Awareness programs provided by the American Hotel and Lodging Association or the National Restaurant Association or other similar alcohol awareness education courses provided or approved by the Alcohol Beverage Control Commissioner. Senate Bill 35 would raise the tax credit for nonfamily adoptions from $2,000 to $4,000. 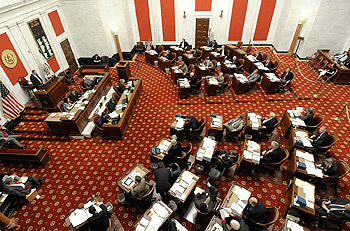 Senate Bill 228 would create the Local Solutions Dropout and Prevention Pilot program to reduce the number of high school dropouts in West Virginia. Senate Bill 229 would provide loan assistance for math and science teachers who agree to teach in areas and schools in critical need of such teachers. Each award recipient would be eligible to receive assistance of up to $2,000 annually subject to limits set forth in the bill. Senate Bill 242 would dedicate five percent of the coal severance tax to the county of origin, provide for a five-year phase-in at one percent per year and provide permissible uses for the funds. Also, the bill would provide for the Development Office to administer distribution of funds, direct the office to put into effect rules for distribution and establish the County Severance Revenue Fund. Senate Bill 307 would create and provide structures and standards for a new Intermediate Court of Appeals. Senate Bill 387 would allow retired officers to carry a concealed weapon in accordance with federal law and would direct the Superintendent of the State Police to create a firearms course. Senate Bill 408 would provide for a health insurance exchange in accordance with the Patient Protection and Affordable Care Act. If implemented, this bill would establish a West Virginia Health Benefit Exchange to facilitate the purchase and sale of qualified health plans in the individual market in West Virginia. Additionally, the bill would establish a Small Business Health Options Program within the health benefit exchange to assist the state’s qualified small employers in facilitating the enrollment of their employees in qualified health plans. Senate Bill 420 would clarify that county commissioners must continue to reside in the district they are elected or appointed to represent throughout the entire time they hold the office. Senate Bill 424 would modernize the oil and gas regulatory program to provide a means to regulate horizontal drilling and drilling processes that utilize large volumes of water. The bill would add “timber” to the list of items for which a land surface owner could be compensated and also, would provide a new section to regulate pooling of gas from horizontal shallow wells. Additionally, the bill would remove the Chief of the Office of Oil and Gas from the Shallow Gas Well Review Board and replace the chief with a person representing the interests of surface owners of real property. Finally, this bill would remove the Secretary of the Department of Environmental Protection and the Chief of the Office of Oil and Gas from the Conservation Commission and replace them with the state geologist and a person representing the interests of surface owners of real property. Senate Bill 465 would enact the Marcellus Gas and Manufacturing Development Act of 2011, which encourages and facilitates the development of oil and gas wells and the downstream uses of natural gas in this state. Additionally, this bill would endorse economic development in this state associated with natural gas production and various downstream uses. House Bill 2096 would allow for the creation of arts, entertainment and enterprise districts within municipalities or political subdivisions and would provide for the application process to be followed by the political subdivisions, as determined the Secretary of Commerce. Furthermore, the bill would permit that the Secretary of Commerce to designate arts, entertainment and enterprise districts from among the applicants. Finally, the bill would further provide for tax breaks for qualifying artists, property tax credits, and exemptions from the admissions or amusement tax. House Bill 2159 would protect members of the news media from being forced to give testimony in any West Virginia court relating to the source of information in a public communication. Testimony could be given with the consent of the person or persons providing the information. House Bill 2362 would increase the penalties for the financial exploitation of elderly persons and incapacitated adults. House Bill 2437 would require cutter heads, long wall shears, and other mining machines to automatically shut-off when the methane level reaches one percent for the purpose of protecting the health and well-being of West Virginia coal miners. House Bill 2500 would continue the bonus eligibility of a class room teacher who holds a valid renewal certificate and accepts employment as a principal or in another school. The renewal certificate must be issued by the National Board of Professional Teaching Standards. House Bill 2524 would rewrite the article governing the practice of speech-language pathology and audiology. This bill would update the standards and conform to current drafting conventions. House Bill 2532 would provide for the regulation of the zipline industry by the Division of Labor. This bill would require permits and inspections of certain equipment. Furthermore, the bill would provide for more training of zipline operators. House Bill 2732 would create a system for public funding of election campaigns. This funding would be provided to candidates for the state Senate and House of Delegates. Each candidate must agree to and abide by restrictions for campaign contributions. House Bill 2763 would prohibit the Executive Director of Workforce West Virginia from billing a reimbursable employer under unemployment compensation laws for overpaid amounts. The bill also would call for the Executive Director to reimburse an employer who has been billed for benefits considered to be an overpayment. House Bill 2879 would provide a one-time supplemental salary increase for state employees. These employees would include: teachers, service personnel, members of the West Virginia State Police and conservation officers. House Bill 2946 would require any medicine containing active ingredients to make methamphetamine to be made available by prescription only. This would include any drugs containing ephedrine, pseudoephedrine and phenylpropanolamine. House Bill 3202 would create uniformity in the way landlords return security deposits to tenants. This bill would provide for penalties for any landlord not in compliance with the regulations. House Bill 3225 would expand the definition of harassment, intimidation and bullying. The definition was expanded to include bullying, harassment and intimidation by way of electronic devices. The bill also applies to incidents outside school grounds if it in any way interferes with the orderly operation of the school. To date, 160 bills have been passed by the House of Delegates with 42 meeting approval on March 2. In the Senate, of the 155 measures passed, 35 advanced on the last day each body could address bills in their house of origin. In total, the West Virginia Legislature has handled 1,887 individual pieces of legislation this session.